Marcus Maddison is expected to be fit. A fifth successive derby triumph over MK Dons tomorrow (February 21) could ignite a Peterborough United charge into the League One play-offs. Darren Ferguson’s side have not lost to their fierce rivals since the opening leg of a League One play-off semi-final back in 2011. The latest mouth-watering clash at Stadium MK is the first in a series of testing away trips to high-flying opponents which Ferguson feels are going to prove significant in determining whether or not they can gatecrash the top six. After visiting the second-placed Dons, Posh must also travel to Swindon (currently third), Preston (fourth) and Sheffield United (fifth) in the coming weeks. Ferguson, whose side will kick-off four points adrift of the play-off spots, said: “We have a lot of big away games to come and there is no doubt we are going to need to get results in some of them to reach the play-offs. “There is usually a team that gets into the play-off places late on with a lot of momentum and this season that could be us. “A good result against MK Dons would really help in that respect and I’m looking forward to a good game on a good pitch complete with a great atmosphere. “A great rivalry has grown between the clubs and the fans turn out in abundance. They are games we always seem to do well in. “The philosophy of both clubs is very similar, but they have done slightly better in bringing their own younger players through whereas we have perhaps done better at picking up young players from elsewhere and improving them. Ferguson senses Dons have the belief that they can climb out of League One this term after spending several years knocking on the promotion door. And he is also adamant his own team will also take to the field with more conviction than they showed during a 2-0 defeat at table-topping Bristol City on Tuesday (February 17). Ferguson added: “Dons have been there or thereabouts in this league for several years without ever actually managing to get a promotion. “But I sense they are a lot more resilient this season and have the belief they can go all the way. They have added goals to the all-round performances they have always had. “However, there is no doubt they will also be fearful of facing us due to our record against them. “We will pay them all the respect they are due, but we are going there to try to win the game. “I felt the belief that we were going to get something was missing from our game at Bristol City last Tuesday, but that definitely won’t the case tomorrow. This morning Posh were still hopeful of drafting in a new striker on loan ahead of the trip to Milton Keynes. Ferguson may also attempt to recruit a midfield player now Jermaine Anderson has been ruled out for the rest of the season. 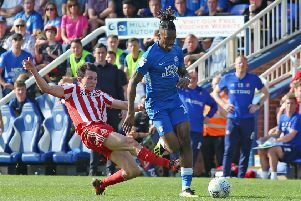 Marcus Maddison and Joe Newell are both expected to be fit to face Dons after recent injuries.